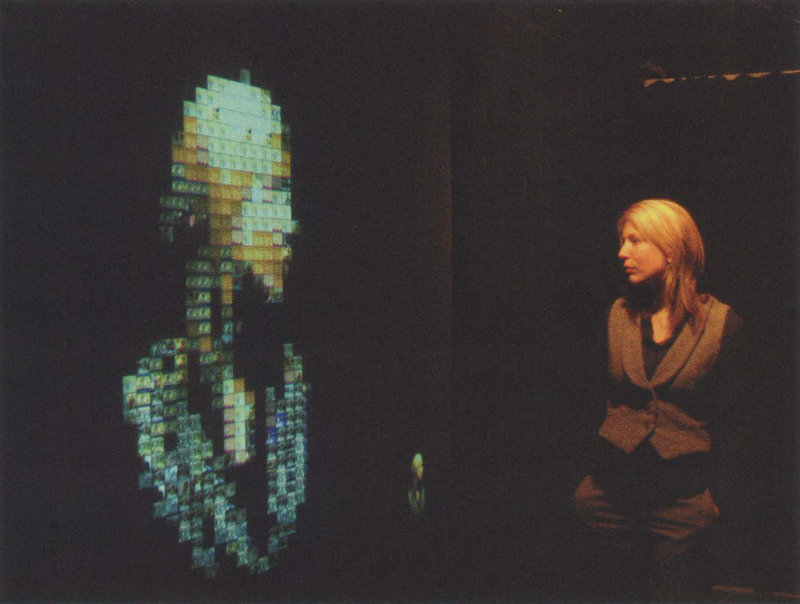 Media Mirror is an interactive video installation in which over 200 channels of live cable television are continuously arranged in real­time to form a mosaic representation of the person that stands in front of it. The piece explores the bidirectional relationship each of us has with mass media. It attempts to illustrate how we are inexorably shaped by the media, while at the same time, how the media itself reflects the demands of our society. The piece is also simply meant to evoke an overwhelming sense of the sheer scale of mass media. When no user is present, Media Mirror places itself into an autono­mous mode, in which the piece forms mosaics of one of the live channels. In effect, the mirror gets turned into the media itself. While techniques for constructing photo mosaics are well known, there has been little work in constructing mosaics on video se­quences [Klein et al. 2002]. However, since we restrict ourselves to utilizing only the latest (“live”) frames of video, the optimization prob­lem becomes much more tractable, as the working dataset is much smaller (-256). Template matching is performed on decimated prox­ies of all video sources on the graphics hardware. A slight amount of luminance correction is applied to each tile. It was found that this combined with a distance function that is weighed towards chroma components works well. As in [Klein et al. 2002], working with video tiles brings up a new issue: temporal coherence. If the problem is treated as an individual per-frame photo-mosaic, the resulting output tiles lose their original sense of continuity. Consequently, we apply a temporal weight to the optimization-cost function, in order to bias tiles to remain “tuned to the same channel” as long as possible.